The schoolhouse has been moved from its original site, about ¼ of a mile away from the top of the small hill southeast of its current location. The schoolhouse site had a large and relatively level playing field on one side of the building and the student bathrooms were located down the hill on the other side. 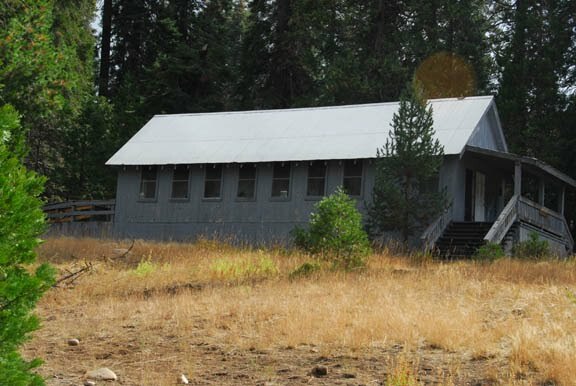 This school was built by Pine Logging Company in 1952 and was situated across the playing field from the old schoolhouse. 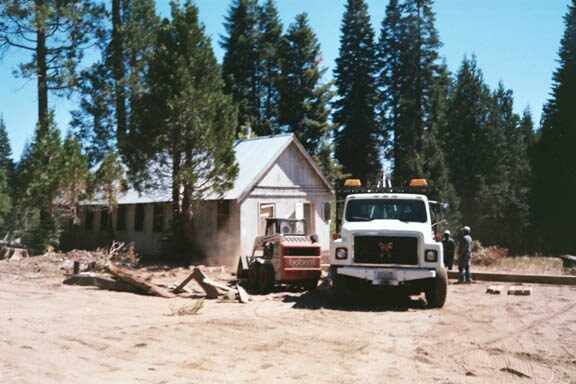 The Pine Logging Emergency Elementary School (Emergency because is was seasonal and located in a remote area) was a Fresno County Public School. Pine Logging Company provided the schoolhouse and some extra benches, stools and tables, but all of the textbooks and school supplies, and the salary for the schoolteacher was provided by the school district. Schoolteacher Mrs. Elsie Hicks taught grades 1 through 8 with usually one or two students in each grade. School started in the fall when the Fresno public schools began and continued until the mill closed around late October or early November. School resumed again in the spring when the mill opened, usually in April. Fresno County School District required that at least 12 children be present to open the school. Every spring Leo Chase, the company clerk, would call around to the various families for a head count and perhaps a bit of prompting to round up the requisite number of children to enable the opening of the school. He must have been successful because school always opened. Each spring our family waited for the snow to melt so we could move up to camp. My dad needed to be up at the mill when it first opened for the season, but once my sister reached school age we couldn’t move up until there were enough students to open the school. Every spring we eagerly awaited updates of how many children would attend school that year. Since it was a mostly stable workforce of returning workers it was a matter of which family was moving up in the spring or waiting until summer, but there was always a possible new family being added. One way or another the school always managed to open. The schoolroom was filled with a series of desks of various sizes, the smallest in the front and the largest in the back next to the stove. At the beginning of each school session we would try out the various sizes of desks to see which fit us best because of course we had grown during the intervening time, although often not as much as we thought or hoped. It was one little mark of distinction to work ones way up through the different sized desks. The stove in the school was similar to the stove in most of our cabins, an oil barrel set on its side and resting on legs a couple of feet off the ground. The shop mechanic cut a big hole in one end of the barrel and then soldered on a metal door on hinges and this door was used to add wood to the fire. A hole was cut at the top of the back of the barrel through which the stovepipe extended up through the ceiling. In the early spring and late fall this stove provided the heat for the school, and depending upon where one sat it was often a little too warm or too cool and we tried to shuffle our desks around accordingly. The schoolhouse had no ceiling so most of the heat would have gone straight up to the tin roof. The bullcook delivered a pile of wood for the stove each season and I think he hauled the wood inside and started the fire most mornings. Howard Aubouchon started the fire when he was a 7th and 8th grader since her lived across the playing field in the old schoolhouse that had been converted to a cabin. At the end lunchtime and each recess girls lined up on one side of the schoolhouse and boys on the other because entry to the schoolroom was via the boy’s entry vestibule and the girl’s entry. There we washed our hands one at a time before entering the schoolroom. In retrospect the hand washing was a wise and necessary ritual and we probably should have also washed our faces and dusted our clothes. We had 2 flush toilets were outside down the hill in a two room outhouse, and no, it never seemed odd the combination of outhouse and flush toilets with the sinks in the entry vestibules. We had no school bell, only a little plastic whistle Mrs. Hicks would blow at the end of lunch and recess. I think school must have started with the 8am whistle with lunch at the 12pm whistle and resumed again at the 1pm whistle. School for the primary grades ended about 2pm but the bigger kids (grades 4-8) were able to stay until 3 or 3:30pm. I was pretty envious of those big kids who got to stay in school later because school was far more interesting than being at home by myself. I always looked forward to school at the mill because during the cool days of spring and fall it gave us something to do during the day. Conveniently all the children living at the mill gathered at school and thus provided ready playmates. We had our share of altercations but generally all ages and sexes got along pretty well because it was a small community and we didn’t have many playmates to choose among. Our teacher Mrs. Hicks valiantly tried to introduce new games but I remember playing either stealing sticks or softball every recess and lunchtime with a few exceptions for dodge ball. We did try playing capture the flag but it wasn’t nearly as much fun as stealing sticks because once the flag was captured the game ended. With stealing sticks we had to get all 8 or so of the sticks to the other side and it made for a much longer and exciting game. We had a relatively level playing field out between the new schoolhouse and the old schoolhouse and lines for stealing sticks and baseball were drawn in the dirt. The sticks were carefully chosen and painted bright yellow for greater visibility and to prevent any misunderstanding regarding exactly which sticks were part of the game. For softball there were several prized baseball bats especially the Mickey Mantle and Ted Williams, and we would divide up and choose teams. The biggest boys were always the first chosen because they were the best players and when there weren’t two big boys, the presence of the one older guy would almost always guarantee a winning team. We had one other school wide activity other than recess and that was music. Each day after lunch we would pull out our music books and sing. Mrs. Hicks began her teaching career as a music teacher years earlier in Ohio and I’m quite sure music was all she had ever taught before arriving at Pine Logging. Her husband was an engineer on the four lanes highway and they lived in Shaver Lake. I’m not sure how they ever found her and convinced her to drive to Dinkey to teach, but she was a lovely woman we all admired despite her persistence regarding music. I can’t remember any of us being particularly musical but no matter. Every day after lunch, we sat down in our desks and sang, no shirking. The songbook was the same throughout my school years and I still remember singing The Battle Hymn of the Republic and Ceilito Lindo. Sometime in the early 50’s the school had obtained an old upright piano, probably at the instigation of Mrs. Hicks. She usually played the piano and sang along with us leading us in song. Most of the schoolwork was done using workbooks and texts, a necessity since it wasn’t unusual to be the only person in a particular grade, and something most of us loved because we could work at our own pace. In the springtime many of us the raced to finish up our work for the grade we were in because Mrs. Hicks allowed us to then start on the next grade’s workbooks. There was some competition to see who could go the farthest in their work because even if we were in different grades we could still compete by the number of workbook pages completed. If we needed help with our schoolwork we could always ask the teacher or someone in a higher grade and we knew who in the upper grades were the more helpful. I also remember one pretty good student about my age that helped his older bother with his schoolwork. Although my sister Ann helped me learn how to read I never asked her for much help with math because I would hear statements like, “well it’s so obvious,” when it never seemed that obvious to me! She later graduated with an advanced degree in Computer Science. One especially strong memory is of one particular reading book with a red cover that I read in the spring of 3rd grade although it was a 4th grade reading book. That fall when we moved to Fresno the teacher put me in the second highest reading group, an insult but one which I stoically bore until several weeks later when the highest reading group started a new reading book, that same red book I had read the previous spring. After that reading group finished I raced up to the teacher to clarify matters and at first she didn’t believe me but then I started telling her the stories in the book so I must have worn her down because I remember moving up to the highest reading group. Mr. Frazier, from the Fresno County School Office would come up from Fresno on a regular basis, every week or every other week, and he brought a rotating supply of library books (always eagerly anticipated) and other instructional materials including science materials that he would leave with us until his return trip. My favorites were the several prisms he once brought and demonstrated in the sunlight. Also remember that if you wanted to work on tomorrows work assignment at home, you could work with some of the instructive items that the Mr. Frazier would bring for the school. I remember we had a chest full of science equipment, experiments and such and I enjoyed the “science” stuff in the chest and would frequently do my assignments in advance so I could take advantage of time with the instructional equipment. I also remember that one of Mrs. Hicks’ favorite hobbies was fishing and she would share fishing stories with me on Monday morning following some of her fishing adventures.